Founded in 1960, King Engine Bearings is a world-class developer and manufacturer of engine bearings for automobiles, light to heavy-duty trucks, marine, aviation, standby power and other types of internal combustion engines. 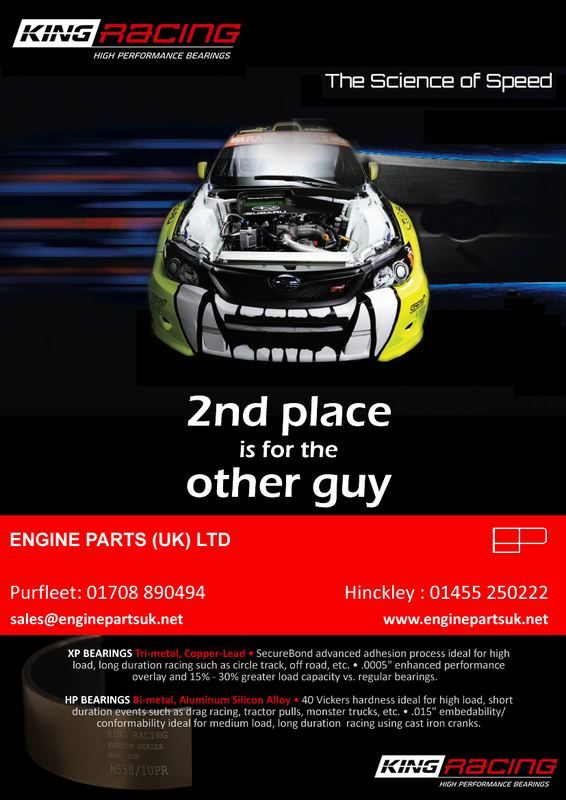 King's only product is engine bearings. 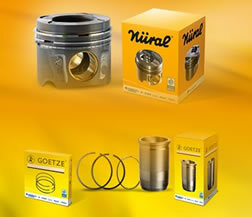 As a result of its specialization and focus, the company is recognized for producing the highest quality engine bearings available in the market today. 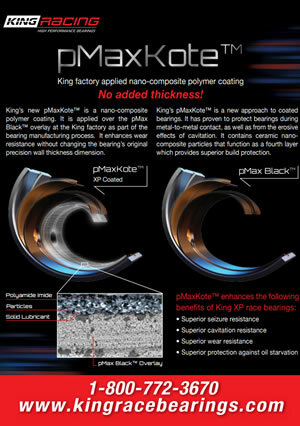 The King line includes OEM replacement rod, main, cam bearings, and thrust washers and its special range of high-performance bearings. King’s extensive coverage of domestic and import engine bearings ship from its main distribution center in Cedar Grove, N.J. and 11 strategically located factory branch warehouses. Through the years, King has developed and maintained a philosophy of constant improvement, from bearing design and engineering to customer service. The company is a certified TS16949 (automotive) and AS9100 (aerospace) manufacturer, producing to the highest statistical quality control standards. Typical race bearings are manufactured to meet the industry’s traditional +/- 0.00025 ” wall thickness tolerance. 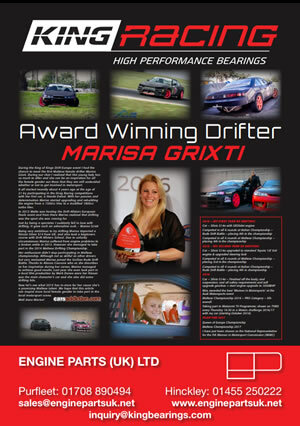 But race engine builders often prefer narrow, more specific oil clearances with far more tolerance control. To achieve the right clearance, they compensate for bearing thickness inconsistencies by grinding cranks “fat” or “thin”, adjusting the housing bore, or purchasing multiple sets to “fish” for shells. The process is time consuming, costly and tedious. 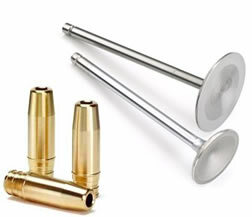 Bull’s Eye Tolerance™ is a production technology developed by King. It combines highly accurate machining, overplating, and computerized wall thickness monitoring that adjusts the process on-the-spot. Bull’s Eye Tolerance™ outperforms the industry’s wall thickness tolerance, ensuring the least thickness variation shell-to-shell. The outcome: A new standard in bearing thickness consistency. New Design of Oil Groove (U-Groove™) The level of specific load applied to the grooved bearing may be lowered by means of a reduction in groove width. Fig.1 shows a cross section of a bearing with a conventional oil groove design. The effective bearing length is L-U1. It may be increased by a simple decrease of U1, but it would reduce the cross-sectional area of the groove. 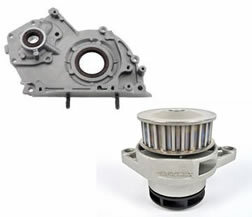 This is an extremely undesirable modification, particularly for high-performance bearings generating high oil flow rates due to operation at high rotation speeds. 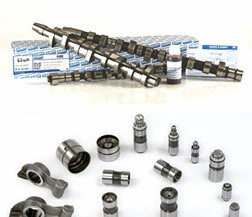 The connecting rod bearing is lubricated by oil passing through the main bearing groove and then the oil passages in the crankshaft. The amount of oil entering the connecting rod bearing should be not lower than the oil flow produced by the hydrodynamic lubrication of the main bearing. A reduction of the cross-sectional area decreases the passage capability of the groove, which may cause a formation of oil starvation conditions in the connecting rod bearing. A new design should result in a reduction of the groove width without decreasing the groove cross-sectional area. The modification according to these demands is presented in Fig.2. The rectangular shape with small chamfers has allowed reduction of the groove width at the top (U) by at least 30%. On the other hand the cross sectional area A has not changed due to an increase of both groove width b and groove depth h.
Race bearings often come with a larger oil hole. In most cases, the larger oil hole exceeds the boundaries of the oil groove and reduces the bearing’s effective surface area. 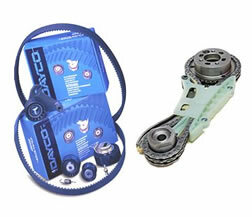 As a result, the bearing suffers from a significant loss of load capacity and hydrodynamic regime stability. 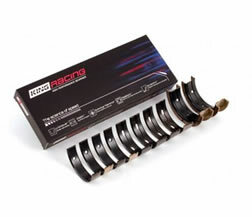 In response, King Racing Bearings TechLab developed ElliptiX™. 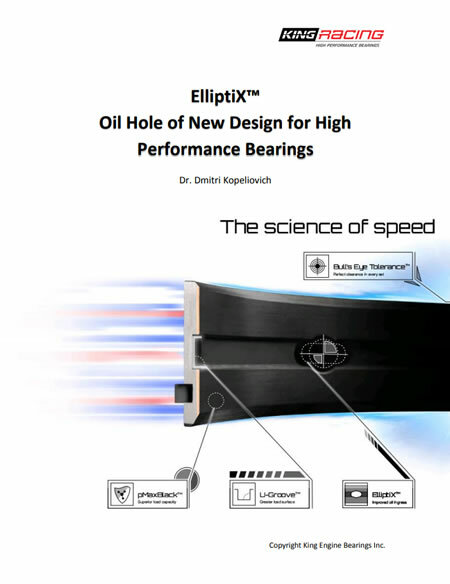 EliptiX™ is a newly designed oil slot/oil hole hybrid that improves oil ingress, without affecting the bearing’s surface. The innovative changes to the slot hole prevent a compromised load capacity. 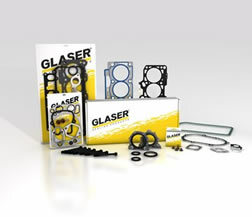 A common industry practice is to design race bearings with excessive crush height. However, the extreme operating conditions and degree of individualization in today’s race engines call for greater design precision. King responded with RadiaLock™. 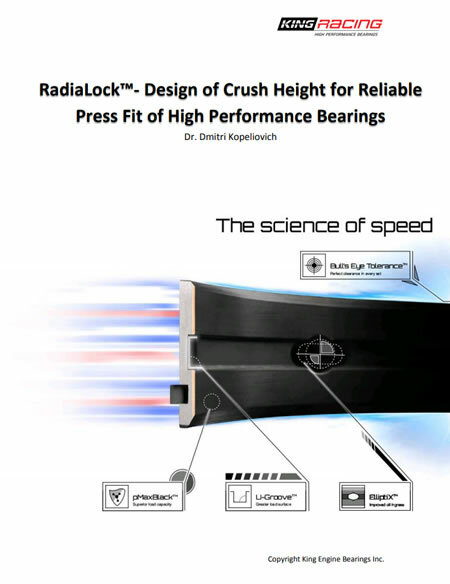 RadiaLock™ is an optimal crush height value obtained from an optimization process that customizes each bearing crush height to its specific performance requirements. During the process, King’s ENSIM™ system analyzes optional height crush values, taking into account engine block or conrod material, the coefficient of thermal expansion, torque and more. Following the process, the perfect RadiaLock™ is reached for each bearing in each application. 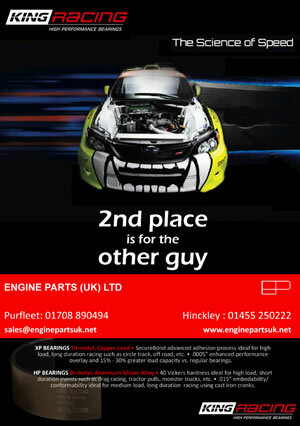 King racing bearings are now widely used across the UK and have been for many years in the USA. Successful race engine builders are constantly pushing the limits of load capacity to new levels. Race bearings today inevitably need to match these demands with more competitive bearings. 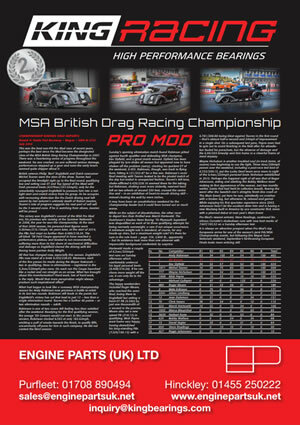 At King Racing we met the challenge with the XP high-performance bearings series.